People trust Seed of Peace to facilitate healing and reconciliation in their communities: we work in Bristol, around the UK, and in countries like India and Nepal. We can help you understand the roots of conflict, leading to deeper relationships, greater co-operation, a more just and compassionate world. We have an ongoing programme of activities. Are you in a situation that would benefit from inviting us in to share Nonviolent Communication (NVC)? Please get in touch! In 2019 we will be running courses in Bristol in three cycles. Each cycle has an Taster Session and two six-week courses, a Level One and a Level Two. The Year Training will be in Glastonbury. Our introductory, Taster Evenings are open to anyone who would like to know more about NVC before committing to a Level One course. The next, low-cost evening will be on 11 March 2019, 13 May 2019, and 7 October 2019, all at the Central Quaker Meeting House, Bristol. Times: 7.15 – 8.45pm. Each six-week, Level One course will give you a foundation in NVC practice. A course will start on 18 March–29 April 2019, 20 May–24 June 2019, and 14 October–18 November 2019, for six Mondays, 7.15 – 9.30pm. (It’s not necessary to have been to one of our Taster Sessions first.) The courses will all be held at the Central Quaker Meeting House, Bristol. If you have already completed a Level One course, you could join us on an intermediate, six-week, Level Two (Deepening) course. Each of these courses will develop a particular aspect of NVC. On 18 March–29 April 2019 we will look more closely at Empathy; 13 May–24 June 2019 our theme will be Anger, and from 7 October–18 November we will explore how to respond to Conflict. The courses will all be held at the Central Quaker Meeting House, Bristol. Times for each evening: 7.15–9.30pm. There are five modules in our Year Training, between October 2019 and July 2020. Each module is a three-day, residential course at Paddington Farm, on the slopes of Glastonbury Tor. The fifteen days total of the training count towards CNVC certification. 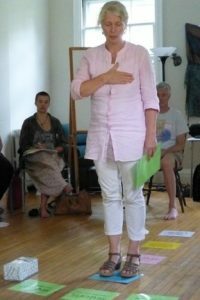 All modules are led by Shantigarbha and Gesine Schrader.